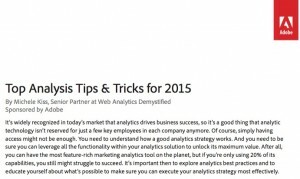 Analytics has the potential to be incredibly powerful for businesses. However, companies sometimes don’t know where to start, or how to take advantage of the capabilities of their digital analytics solutions. From just getting started with the basics, through advanced segmentation, mobile, attribution, predictive analytics and data visualization, here are a few of my favorite tips for how to do more with your digital analytics program. Michele Kiss is a recognized digital analytics leader, with experience in web, mobile, marketing and social analytics. Her experience ranges across a variety of verticals, including ecommerce, telecommunications and technology, automotive, restaurant, travel and home building, as a client-side, consultant and agency practitioner. As an employee of Analytics Demystified, Michele is a member of the Digital Analytics Association (DAA), an Adobe Business Partner, and a Google Analytics Certified Partner.